My all time favorite detective series, Columbo, premiered on NBC on September 15, 1971. This long-running show ran from 1971 - 2003. 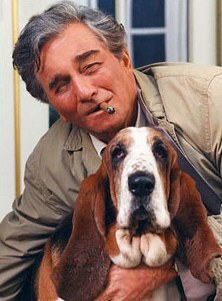 Columbo was a detective played by Peter Falk. He wore a rumpled raincoat, drove a great old car, and had a Basset Hound. There was a Mrs. Columbo, although she was never seen on the show. Columbo's first name is never spoken on the show, although it is on his police badge as "Frank." The most frequent killers on Columbo episodes were Patrick McGoohan (4 episodes), Robert Culp and Jack Cassidy (3 episodes each). Columbo is a cigar smoker. Columbo often looks for food at the murder scene, and enjoys a snack ... although he often travels with boiled eggs. Columbo drives a 1959 Peugeot, Model 403. Columbo doesn't like guns and admits in one episode that he hasn't completed his annual firearm test in five to ten years. This show still airs on Me-TV, is available on Netflix, and I still enjoy watching it. Are you a Columbo fan? I'd love to hear from you in the comments, below. Lin, thanks for visiting! Columbo is one of my favorites. It's always a treat when I discover an episode I haven't seen. The mysteries are so fun and quirky. This is my sister's favorite TV show of all time. She introduced me to it and now I'm a fan also.